One thing many people know about me is I love to write. I am VERY choosy about what I write with, but I loved reviewing these new pilot pens! These erasable pens are NOT the ones you may have used. I remember erasable pens from when I was in grade school, and they were not really all that erasable, so I was skeptical. We do not only love our moms 1/2, but that 1/2 heart was once a whole heart and we erased 1/2 of it! Amazing! The pen wrote really smoothly, as you would expect with a Pilot pen, and erased with ease. And they retract with one simple click! These white pens are so sleek and would complete the look of anyone's desk! We love how clean they look and how well they write! 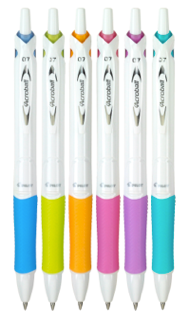 They are a part of the Acroball line of Pilot pens that use Hybrid ink to write! What is Hybrid Ink? The rich vibrance of gel ink plus the quick-drying, water-resistance of ball point ink designed to glide across the page. AND Follow @PilotPenUSA and use #FashionStar on Twitter for weekly live-tweeting sessions during Fashion Star episodes, Fridays 8-9 p.m. ET, for a chance to win even more great prizes. MamaBreak received Pilot pens to review here on MamaBreak. We did not receive any other type of compensation. As always, our experiences and opinions are our own. I'm a pen and paper girl so I would love these pens. As much as I'm on the computer there is nothing like writing down tasks, notes and lists with pen and paper. I do love a good writing pen!! My husband is a pen snob, these look like the kind of pens he'd like. I'll have to get him some. I love Pilot pens!! These ones look really nice and colorful too!